Each Sunday, Bob Gaughan wraps up the college football weekend. Today, that includes a preview of Tuesday’s UB Bulls game. UB has a huge event coming up on Tuesday. First there a high hopes for the UB basketball team after their trip to the round of 32 last year. With most of the team back they kick-off the basketball season at 4pm at Alumni arena against St. Francis of PA. This doubleheader action rolls right into the last home football game for the 8-1 Bulls. 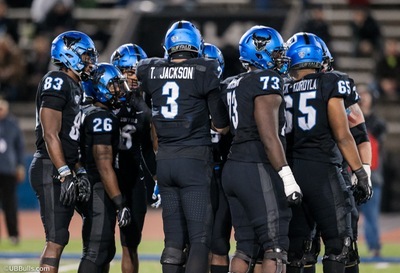 UB football has never started out 9-1 on the season. The football team has never had 9 wins since their return to FBS in 1999. All of this can be accomplished with a win over Kent State on Election Day. The Bulls are coming off a thrilling 51-42 win over Miami-Ohio last Tuesday. Tyree Jackson accounted for six touchdowns in the game throwing for three and rushing for three as well. Anthony Johnson had 238 receiving yards in the game, which is the most ever for a Bulls receiver. Kent State comes into the game at 2-7 and 1-4 in MAC play. Kent won their first MAC game last week over Bowling Green 35-28. Kick-off is set for 7:30 at UB Stadium. So Alabama came into the game with a resume that wasn’t so impressive because they hadn’t played a tough schedule. Some, myself included thought that the 14 point spread was too high against the third ranked Tigers in Baton Rouge. The Tide just dominated this game from start to finish. Total yards in the game were 576-196. Tua Tagovailoa threw for 295 yards and two scores and ran for another. His grip on the Heisman Trophy at this point seems obvious. Key to the game was a dominant Bama defensive line. They put pressure on Joe Barrow all night and the LSU running game could go no where. The Irish pick up a tough road win in Evanston behind two TD passes from Ian Book. Book even ran for a score in the closing minutes to seal the win. The Irish seemed to be in control up 24-7 before Clayton Thorson led a fourth quarter comeback. Two Wildcats TD’s cut the score to 24-21 with 7:05 left. Book sealed the win with a 23- yard run with just under 3 minutes to play. The Irish did outgain Northwestern by over 200 yards and looked like the much better team all night. Notre Dame remains a lock for the college football playoff as long as they win out. Next up for Notre Dame is Florida State. The beneficiary of the LSU Tigers loss appears to be Michigan. The Wolverines were just outside the Top Four in the first College Football Playoff poll. With this dominant win over Penn State they should make their way into the Top 4. The Wolverines did it with defense. Michigan almost shutout Penn State. Penn State had a garbage touchdown with under 2 minutes to play to avoid the shutout. Shea Patterson accounted for three touchdowns for Michigan, who have now won eight straight. Michigan is a step closer to winning the Big 10. The Wolverines haven’t won the Big 10 since 2004. Fun game of the day was in Austin. Neither team could stop the other offense. There were only three punts in the game. The teams combined for 1,100 yards of offense. Will Grier was phenomenal for WV. In most years I would tell you he should win the Heisman. If it weren’t for Alabama’s dominance I think he would have a chance. Grier threaded the needle on a 33-yard pass to Gary Jennings in the back of the end zone with 16 seconds left to make the score 41-40 Texas. Dana Holgorson decided to go for two and the win. This was a smart call because the way the game was playing out. As mentioned above you had to like either teams chances of getting two yards at this point of the game. Grier ran the two-point conversion in to give the Mountaineers the one point win. *Clemson continues to roll putting 77 on the board against Louisville. *Maryland’s tumultuous week ended with a thud. The Terps drop a 24-3 decision at home to Michigan State. *Nebraska is playing much better football. Scott Frost might have the best 2-7 team in football. Ohio State barely survives in the Horseshoe 36-31. *Eric Dungey used his feet more than his arm in Syracuse’s win over Wake Forest. Dungey rushed for 119 yards in the Orange’s 41-24 win. *The State of Florida football is in trouble. Miami of Florida, Florida and Florida State all went down. The Hurricanes are really struggling after losing at home to Duke. Florida State’s rebuild continues as they fall to 4-5 after losing by 21 to NC State. The shocker of the day was Florida getting smoked at home to Missouri 38-17. There is very little sunshine in the Sunshine state this morning. *Washington State continues to lead the PAC-12 after slipping by Cal 19-13. Washington State improves to 8-1, every other PAC-12 team has at least three losses. *Kyler Murray recovered from a slow start to lead Oklahoma to a 51-46 win over Texas Tech. Game may have been different if Tech QB Alan Bowman didn’t have to leave at halftime because of a collapsed lung. *Georgia clinched the SEC east with a win over Kentucky. Their prize is a showdown in the SEC championship game with Alabama. This of course is a re-match of last year’s title game.